Lasers have revolutionized nearly every sector of the health care industry, and one of the most recent areas they have made an impact on is periodontal surgery. Laser periodontal surgery is a particularly welcome technological advance since about 1 in 10 Americans has some form of periodontal disease, and 1 in 20 has moderate to severe periodontal disease. Periodontal (gum) disease mostly affects adults in their 30s and 40s, and involves both infection of the gums and the supporting bone tissues that hold teeth in place. There are three stages of periodontal disease, each one progressively more severe: gingivitis, periodontitis, and advanced periodontitis. The causes of gum disease include smoking, genetic predisposition, certain health conditions like diabetes, and (most significantly) poor oral health. The symptoms of gum disease include swollen, sensitive gums; gums that are bleeding and/or infected; bad breath and an unpleasant taste in your mouth; and teeth that are exposed below the gum line or even loosened. Scaling & Root Planing: This is a non-surgical surface cleaning of teeth, including root areas that may be exposed due to periodontal recession. By eliminating bacteria and plaque deposits, the gums have a chance to regrow and recover. Gum Flap Surgery: This is the surgical cutting of the gums and the pulling back of a flap of tissue. Gum flap surgery permits the periodontist to deep-clean otherwise inaccessible areas. Harmless dental stitches are used to secure the loosened gum tissues back into position. The periodontal laser carefully trims away inflamed gum tissues surrounding your teeth and, if necessary, exposes the root. or cleaned of all tartar, plaque and bacteria. The gums are smoothed out in any places where they have become uneven due to the removal of infected tissues. While traditional methods typically require anesthetics, laser surgery does not. Lasers have the ability to cut away diseased periodontal tissue with far greater precision, both ensuring all infected areas are eliminated and that as little healthy tissue as possible is lost. 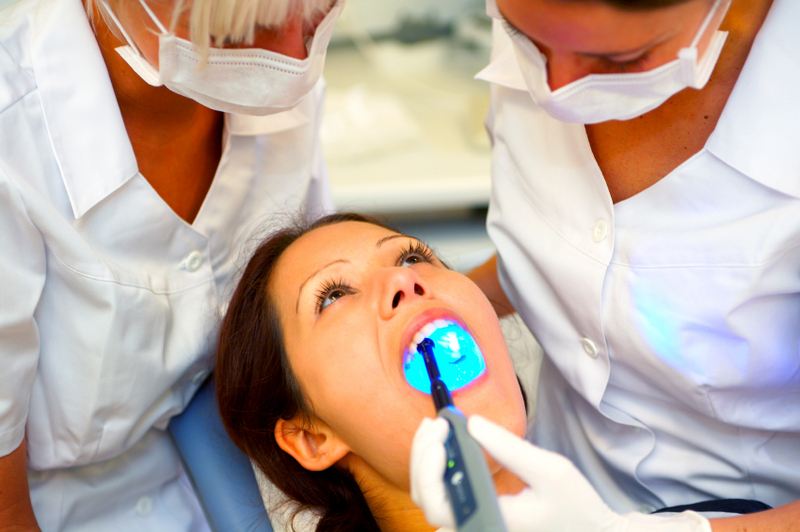 Laser periodontal surgery is less invasive than using a scalpel, which leads to less post-procedure pain and swelling. No stitches are needed to secure gum tissue, and the laser actually stimulates gums to regrow faster. The operation is virtually painless, and there is little discomfort during recovery. Since the laser cauterizes wounded tissues, there is much less post-surgical bleeding. The laser also seals off nerve endings to reduce pain. Healing is typically accomplished in less than a day instead of across several days. The results are long-lasting, almost always continuing for at least five years. Laser periodontal surgery greatly improves the process, results, and recovery aspects of periodontal disease treatment. It generally costs no more than traditional methods, and usually receives equal coverage in dental insurance plans. Not every periodontist has the training and high-tech equipment necessary to successfully perform laser periodontal surgery, but it is worth seeking out someone who does. The benefits of laser-based surgery to your periodontal health are simply too great to pass up. To find out more about how you can receive laser periodontal surgery, contact us today! A healthier, more beautiful smile is just a phone call away!